Jewish Humor Central: Trey Kaley Singers Liven Up the Search for Chametz - Tonight's the Night! Trey Kaley Singers Liven Up the Search for Chametz - Tonight's the Night! Tonight's the night for Bedikat Chametz - the search for unleavened bread. Compared to the excitement of the seder (first one this Monday night, second one Tuesday night - unless you're in Israel) there's not much going on during this usually perfunctory gathering of bread scraps placed around the house to insure that something will be found to justify the blessing that's recited. Well, this year, there's something different. 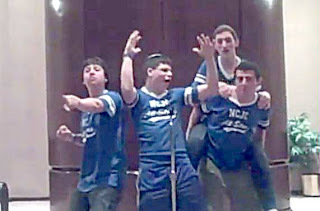 If you like, you can do the search to the music of Trey Kaley, an a cappella group from the New City Jewish Center of Rockland County. The synagogue's assistant rabbi, Jeremy Ruberg, and the Trey Kaley group took the song Tik Tok by pop singer Kesha, and turned it into a rousing accompaniment to the exhaustive search that they conducted in the sanctuary and hallways of the center. So why not liven up your search while playing the song in the background and get your Passover off to a fun start? Check out http://www.youtube.com/watch?v=ineQdUIjG80 for a humorous way to teach prayer melodies.